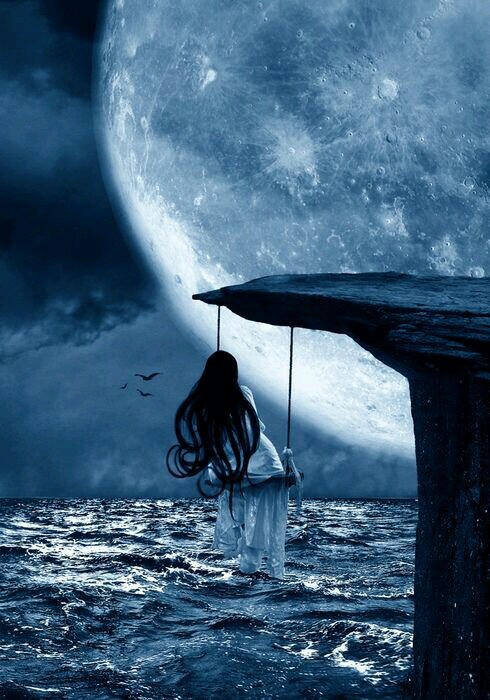 I sat at my window tonight, a soft breeze in my hair and the moonlight on my face. I stared at the moon, contemplating my life and it stared back. But tonight it wasn’t just the moon, it was a poet, a storyteller. A person. She didn’t just illuminate the night sky, she whispered to me. And I whispered back. She shared stories of distant stars and galaxies. She sung songs of the valor and exploits of space pirates. She recited ballads of the past, all the people she had seen, all the beauty she had beheld. She told me about the various blemishes on her face and I shared my flaws and insecurities. She spoke of the silence and I talked about being alone amidst all the noise. We talked for hours and hours. She cried about her lifelong longing for a companion. She just wanted someone to listen and I just wanted someone to understand. And we sat there, stories at our lips, talking of our fears and fantasies, until it was morning and she had to go. I stared at the sky, long after she had gone, replaying the conversation in my head. And finally, when I moved away from the window, moonlight was shining through the cracks in my heart.